Distribution & Habitat: Cocos nucifera is found in all tropical and subtropical regions. Usually found sea level to 150m (490 ft), but will grow at 0–600m (0–1970 ft) near the equator. Cocos nucifera grows in many habitats from areas of human habitation to sandy beaches. Description: Cocos nucifera is a large palm, growing up to 30m (98 ft) tall, with pinnate leaves 4–6m (13–20 ft) long, and pinnae 60–90 cm (23-35 inch) long; old leaves break away cleanly, leaving the trunk smooth. Coconuts are generally classified into two general types: tall and dwarf. On very fertile land, a tall coconut palm tree can yield up to 75 fruits per year, but more often yields less than 30, mainly due to poor cultural practices. Cocos nucifera is among the “world’s most useful plant”, used both for its ornamental value and for its fruit and wood. The oval, 15-to-38cm (6-to-12 inch) long, green or yellow fruit grows in bunches right beneath the crown. Coconut palm thrives in areas of full sun and in a fertile, well-drained soil. The tree is propagated by seed, which is the fruit and which takes a long time to germinate. Fruit: Botanically, the coconut fruit is a drupe, not a true nut. Like other fruits, it has three layers: the exocarp, mesocarp, and endocarp. The exocarp and mesocarp make up the “husk” of the coconut. The mesocarp is composed of a fiber, called coir, which has many traditional and commercial uses. The shell has three germination pores (stoma) or “eyes” that are clearly visible on its outside surface once the husk is removed. Roots: Cocos nucifera has a fibrous root system. Inflorescence: The Cocos nucifera produces both the female and male flowers on the same inflorescence; thus, the Cocos nucifera is monoecious. The female flower is much larger than the male flower. Flowering occurs continuously. Cocos nucifera are believed to be largely cross-pollinated, although some dwarf varieties are self-pollinating. Propagation: Select a coconut in which you can hear the water when you shake the nut. Do not remove the husk. Soak the nut in a bucket of water for about three days before planting. 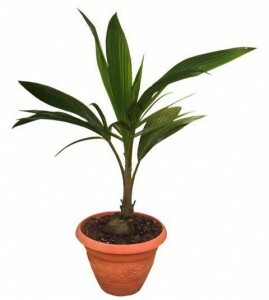 Fill a 25cm (10 inch) deep and equally wide container with a good-quality, well-draining potting medium. Place the coconut in the soil with the pointed end downward and the part that was attached to the tree facing up. Keep 1/3 of the nut above the soil level. Water the planted nut frequently enough to keep the soil moist. Do not over-water. Place the pot in a warm area with a consistent temperature of over 21oC (70oF) and ideally over 26oC (80oF). Grow directly in the garden by selecting a site with partial sun and well-drained soil. Dig a shallow hole and plant the coconut on its side, making sure that 2/3 of the nut is above soil level. Water nut well twice a week. Under optimal growing conditions, the nut or seed will germinate in about three months but can take up to six months to start growing into a plant. New shoots resemble sharp, green spears and will grow out of the part that was attached to the tree. Young tree have a rapid growth rate and absorb required nutrients stored in the nut during the first year. You will need to regularly fertilize the coconut palm after this time for best growth.